Jewel Quest II Game - Download and Play Free Version! 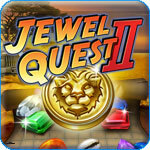 Jewel Quest 2 offers you a new story adventure plus the ability to play others head to head from around the world! If you are a match 3 maniac like many other puzzle gamers, Jewel Quest 2 has a new feature that will drive your mania into insanity! Yes it gives you a great single player Quest Mode with 180 levels, but the best part of this hit sequel is the ability to play other Jewel Quest fans from around the world! Match play is easy as cake. Type in your name and where you are from and the Jewel Quest 2 servers will automatically match you with another player based on your ranking. Both of you will have the same board and start at the same time. 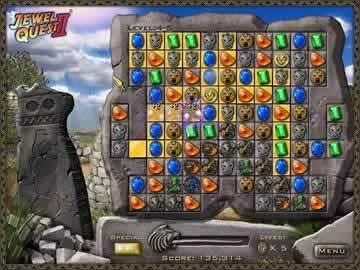 Match 3 or more jewels and the board behind the jewels turns to gold. Turn the whole board to gold first and you can enter the bonus round where you can match silver coins for point multipliers. The highest scoring player wins the match when the time runs out and gets a higher rank. 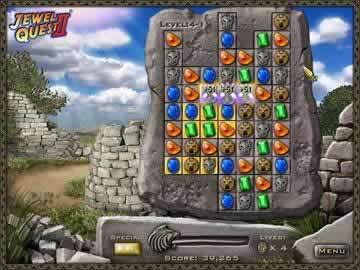 Competitive play in Jewel Quest 2 delivers a really fun game experience plus it makes you into a better player. You will learn to think quicker, notice matches quicker, make more strategic matches to fill in the board first. It's Africa - 1944. Join Professor Pack on the ultimate jewel matching adventure across the world's richest continent. Rearrange precious relics to turn tiles into gold as you advance through relentlessly challenging puzzles. The wilds of the safari, the history of the Zimbabwe ruins, and the majesty of Victoria Falls await your discovery, filled with puzzles of skill, treasure, and twists. And with 180 puzzles, Jewel Quest 2 will have matching for a long, long time!